Health monitoring is evolving in workplace benefits. It is estimated that one in six Americans now wears a fitness tracker or a smart watch and 77% own a smart phone, up from just 35% in 2011, according to the Pew Research Center. In the newest evolution of digital health monitoring in the workplace, these technologies are converging. The accumulation of personal data on wearable devices has changed the definition of employee wellness. A key component in the evolution of tracking employee wellness is the ubiquitous smart phone. Experts view consumer access to medical records via mobile devices as a logical next step in the health app revolution. 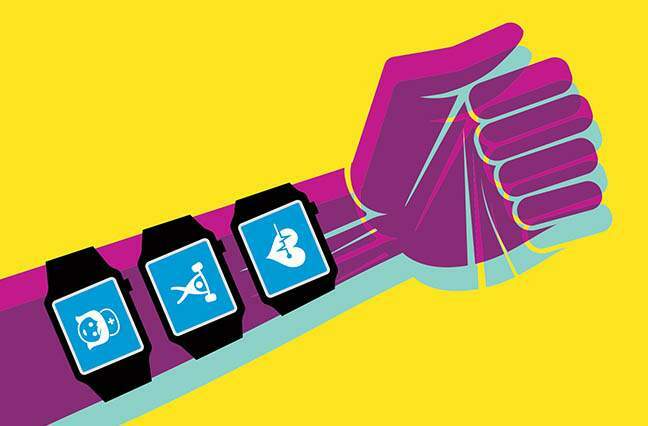 Using wearable devices to track employee fitness is not a new concept. As long as a decade ago, pre-Fitbit, some employers were using pedometers to track the number of steps their employees took every day and launching fitness programs in hopes of cultivating a healthier workforce. That monitoring might include how many steps an employee takes each day or how many hours of sleep the employee gets at night or even medical data such as the employee’s heart rate and glucose level. Taken collectively, such an accumulation of personal data has changed the definition of employee wellness. Of course, a key component in the evolution of tracking employee wellness is the ubiquitous smart phone. When you take the ability to monitor and collect data on all different markers of your health, then house that data in a phone with apps that allow you to send that information to others, your wellness becomes much more actionable. Experts view consumer access to medical records via mobile devices, although still in its infant stages, as a logical next step in the health app revolution. The number of employers offering benefits packages using health tracking devices is huge and growing annually. Mercer recently partnered with the Health Enhancement Research Organization in a study of well-being best practices that included around 2,000 employers. Of the employers completing the survey, 60% reported using a tracking device. “That may be high, but probably somewhere between 40 and 60% have something in place,” says Steven Noeldner, a health management consultant for Mercer. In addition to using trackers, employers are increasingly using app-based digital platforms to deliver wellness benefits to their workers. Through apps, employees can engage in everything from tracking fitness goals to competitive challenges with co-workers or management officials. As a practical matter, we all wear a wearable device today known as your iPhone. It knows where we are, it knows where we go, it monitors how much we walk and it has a good sense of what we eat. For most employers, the original goal of fitness trackers was to cut double-digit increases in healthcare costs. While a healthier workforce certainly would seem to be a factor in controlling healthcare claims and overall healthcare costs, it was difficult then—and is difficult now—to actually prove that link. And a far different reason than cost control is now motivating many employers to offer a robust employee wellness program: the desire to attract and retain a high-quality workforce in a tight hiring market. For employers, Noeldner says, one of the primary motivations behind wellness programs is simply to engage their employees. “We know that employees engaged in well-being are more engaged with the business and their performance is enhanced,” he says. Some employers offer free tracking devices and provide financial compensation if an employee achieves certain fitness goals. Others find the challenge of competition, with individual co-workers or teams or even company executives, often gets more employees involved. But, as is the case with wearable devices in the workplace, there is little hard evidence that health apps are actually bringing about the promised results. Most of the time we have found that providing financial reimbursement in the benefit space isn’t necessarily driving greater success. The apps that are offering motivation cues—recognition of miles or goals—those tend to be the apps that people stick with and use. If somebody’s not motivated to change, an app is not going to make that happen. Risk-management experts say mobile health will make its biggest impact from its capability to monitor a person’s blood sugar level for diabetes or other serious medical conditions, such as heart disease or autoimmune diseases. “Some of the greatest benefits are likely to occur on the health insurance side of the business because of the fact that continuous monitoring of chronic medical conditions, and preventing those conditions from spiraling out of control, would have immediate and demonstrable benefits,” Hartwig says. “For instance, an individual who is diabetic and monitoring their blood sugar and their weight constantly, to the extent that these things could be monitored over time, could make doctors aware and help make adjustments. In addition to the difficulty of evaluating medical outcomes, there is also a cost barrier for many employers. Although companies of all sizes are involved in the well-being revolution, some employers are struggling with how to meet employee needs, because overall healthcare costs are still rising and the mobile health platforms are not cheap. The National Business Group on Health reported in August that annual per-employee benefit costs are expected to rise 5% in 2019, reaching $14,800, of which employers generally cover around 70%. And it costs employers an estimated $500 to $600 more per worker for employee engagement and well-being. Smolensky agrees. Cost is an issue, she says, for employers who work with NFP, which she describes as “midsize market companies, not Fortune 500 companies.” While some want to “do the right thing,” she says, others would rather manage their medical expenses. “They are asking us what type of carrier system is providing support so they don’t have to spend money elsewhere,” she says. Of all the sectors involved in mobile health services these days, insurers are the least likely to have the suite of digital wellness options employers are seeking. Does a free Fitbit make me more inclined to go to that company? I’m not so sure. But if the employer cares about me with a whole suite of benefits—my health, my family’s, my training—and cares about me as a person, that human element is very important in helping me to determine whether to take that job. Budgetary concerns notwithstanding, it is hard to imagine the trend will reverse. Millennials are now the largest generation in the workforce, and they are more health-conscious than their Gen X counterparts. And because they grew up online, they have an expectation they will have programs tailored specifically for them, which is what a digital platform of apps addressing well-being and wellness does. The market for mobile health services is huge. A recent report by Market Research Engine estimated the global market for various healthcare apps and technologies will be $59 billion by 2020 and around $104 billion by 2022. According to the report, the market includes product lines such as blood pressure monitors, blood glucose meters, chronic care management, healthcare and fitness apps, women’s health monitors, diabetes monitors, various forms of motion trackers, ECG monitors, pulse meters, sleep apnea monitors, digital skin sensors, and weight-loss, fitness and nutrition apps. A 2015 article in Employee Benefit News estimated there were 40,000 available health-related mobile apps, and that was three years ago. Some brokers have created alliances with various digital health tool providers to serve their clients, and some employers are hiring their own health advisors and setting up the systems themselves. Others are using brokers, consultants or third-party administrators to identify vendors that will provide the apps to meet their goals and handle the data that is collected. At present, the most popular well-being programs involve motion tracking, fitness and weight control, areas that focus on physical health and personal accountability. But other programs are focused on medical issues such as diabetes, mental health and stress. As acceptance of mobile health apps grows, so has the interest in allowing employees to easily access their medical records. Apple is working to bring protected health information (or PHI) to iPhones, iPads and the Apple Watch. Having PHI on mobile devices would give individuals the ability to access, retrieve and share that information without the time-consuming processes of phone calls, faxes and appointments or the physical pickup of records from different providers. Last year Apple introduced a significant update to its Health app, debuting a feature for consumers to see their available medical data from multiple providers whenever they choose. Working with the healthcare community—a host of hospitals and clinics are making this feature available to patients—Apple created its Health Records based on FHIR (Fast Healthcare Interoperability Resources), a standard for transferring electronic medical records. Google, Amazon and Microsoft have followed Apple and adopted the FHIR data standard, which means all companies and devices will be able use the same standard to obtain and share medical records and other health information.